On Twitter, I remarked that Marilyn had summarized the entire modeling cycle in a single tweet. But the part of that cycle she summarizes best is the last: validating your answer. 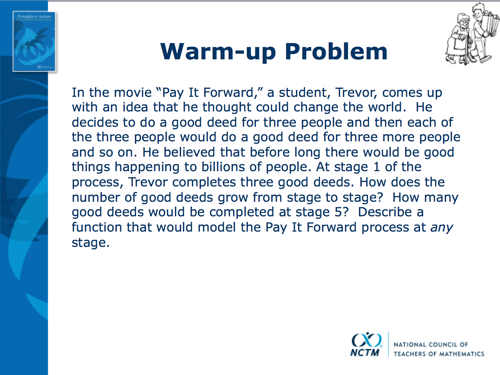 With mathematical modeling, you don’t have to be the answer key. The world is. If you have total faith in the perfect accuracy of your mathematical models, testing with water may sound unnecessary. For the 99% of your students who wonder if math has any power outside of their textbooks, test with water. It was one thing to manually figure that out [if some glue could hold up a human], and then another to try the same thing with a bowling ball experiment modeling the same thing. We were able to see if our answer actually held up in that situation, it was a moment that will stay with me forever. It’s a real world problem, by most definitions of the term. But let’s not let that fact satisfy us. It’s possible for math to be real-world, but also unnecessary. For example, I can ask students to use trigonometry to calculate the height of a file cabinet. But that math isn’t necessary when a measuring tape would suffice. The same is true here. I can find Stages 1 through 5 by multiplying by three successively. So why did we invent algebraic representations? Life would be so much easier for both the student and the teacher if we relaxed that condition. 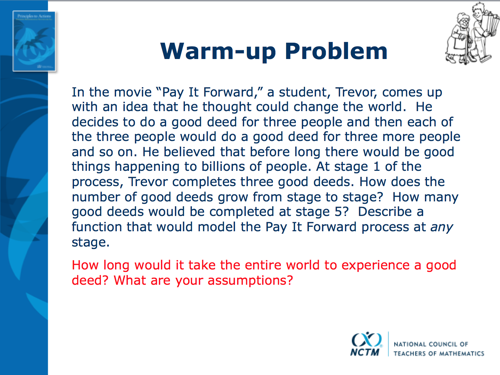 But if we added the question, “How long would it take the entire world to experience a good deed?” we will have both a) identified the need for algebraic functions – to calculate outputs given any input, even distant inputs – and b) put students in a position to experience that need. That’s a two-step process. 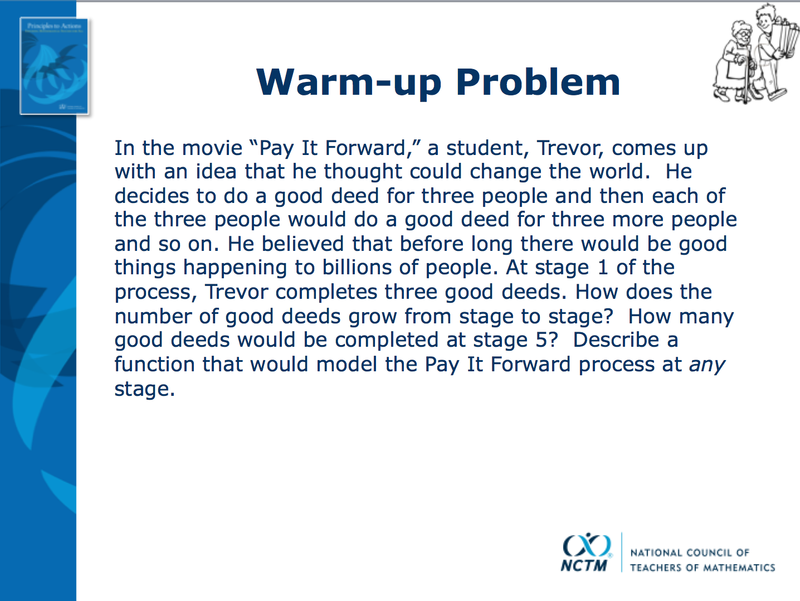 With the line, “Describe a function that would model the Pay It Forward process at any stage,” the author satisfies the first step. He understands the value of algebraic functions, himself. But without our added question, that’s privileged knowledge and we’re hoping students infer it. Instead, let’s put them directly in the path of that knowledge. Real world, and also necessary. [Updated] Will It Hit The Hoop? I think the core concept still works. 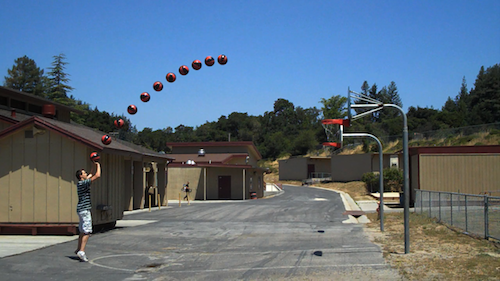 First, students predict whether or not a shot goes in the hoop based on an image and intuition alone. Then they analyze the shot using quadratic modeling and update their prediction. Then they see the answer. 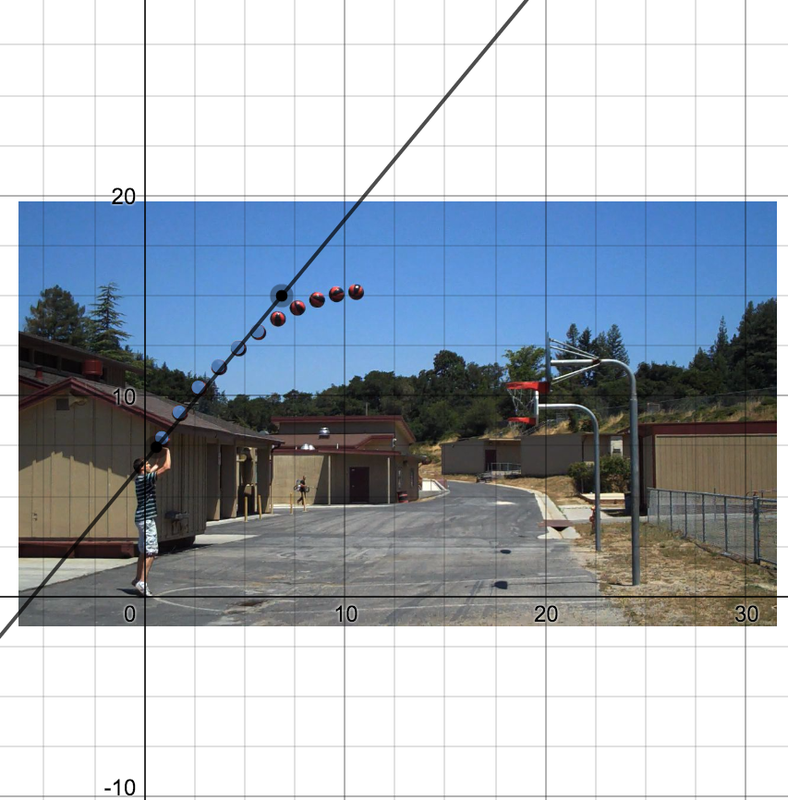 For most students, quadratic modeling beats their intuition. The technology was a chore, though. Teachers had to juggle two dozen different files and distribute some of them to students. I remember loading seven Geogebra files onto student laptops using a thumb drive. That was 2010, a more innocent time. 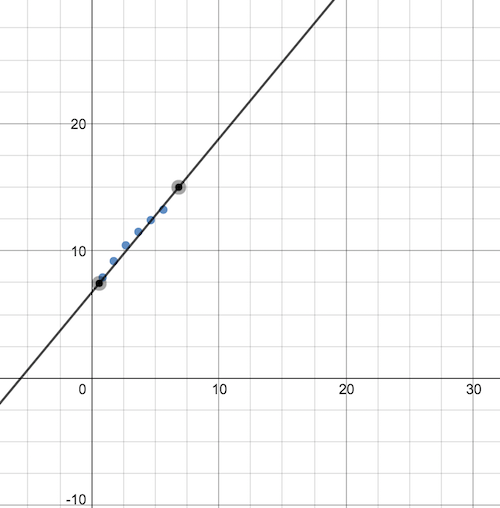 So here’s a version I made for the Desmos Activity Builder which you’re welcome to use. It preserves the core concept and streamlines the technology. All students need is a browser and a class code. Six year older and maybe a couple of years wiser, I decided to add a new element. I wanted students to understand that linears are a powerful model but that power has limits. 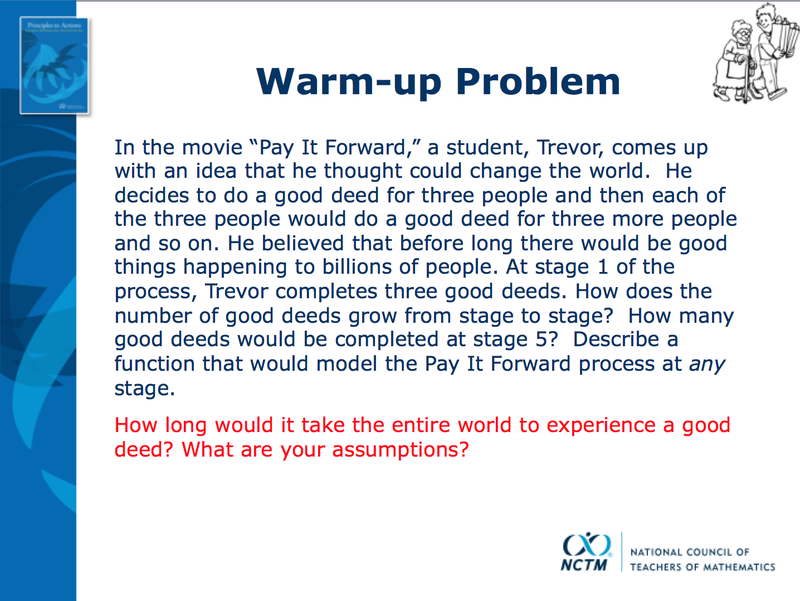 I wanted students to understand that the context dictates the model. So I now ask students to model this data with a linear equation. And then we introduce parabolas. Here are three gas station pumps. Which ones are trying to rip you off? Can you tell just by looking? After your students have that debate and share their reasons (expected: “the third is a ripoff because it’s moving faster”) invite your students to collect data for each pump and enter it at Desmos. Here we’re establishing a need for a graphical representation. It may reveal patterns that our eyes can’t detect. The third act helps clarify the underlying trends. 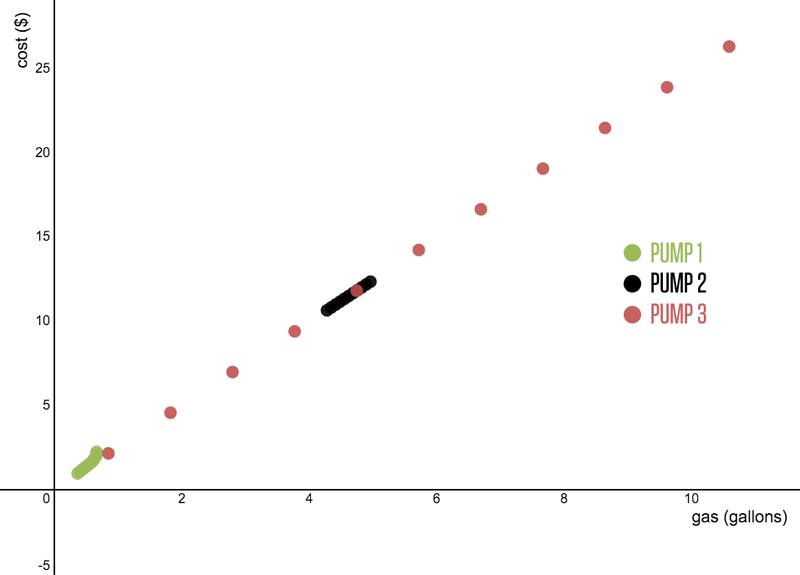 The third pump is spinning faster, but the price and the gas still exist in a proportional relationship. The first pump, meanwhile, pumps less gas per dollar the longer it runs. I am indebted to William G. McGowan and Sean Berg, whose NCTM 2016 session description included the words “gas pumps have been hacked,” and there went my weekend. Their description reminded me how important it is to expose students to counter-examples of the relationships they’re studying, protecting against over-generalization. (ie. “Everything is proportional. That’s the chapter we’re in!”) I’m becoming fascinated, in general, by problems that ask students to prove that a mathematical model is broken rather than just apply a model that works.